The sound blasting through the near sunrise morning was like that of a staccato drilling machine, one would imagine coming from a pneumatic wooden hammer slamming into the thud of wood-on-wood. “Thrud-d-d-d-d-d-d-d Thrud-d-d-d-d-d-d-d Thrud-d-d-d-d-d-d-d.” Pause, then repeat again. Several times. Then a longer pause. Only to start again, repeating the cycle. It was hardly annoying. In fact I rather enjoyed it. It kept me awake while waiting for that hoped-for deer to come down this well-worn trail and stopping in the rut just inside of the bow and my-shot-confidence, range. I had actually dozed off when I had the distinct impression of being watched. It was then I realized my eyes were closed. On the off chance that the ‘watch’ was coming from a deer; though unlikely since I was 14 feet off the ground; I decided to slowly open on eye. 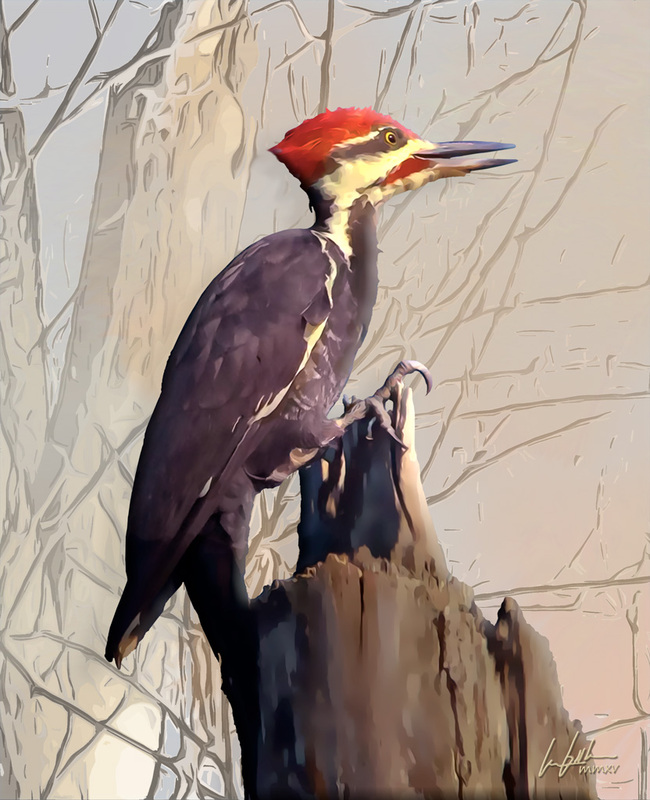 ‘The Pileated Woodpecker Morning’, is an eLITHOGRAPH by les booth, measuring, 13” x 16”; digital original; printing out in acrylic oil format. As the eyelid breached its locked position, I was greeted with a – less than 12-inches from my eyeball – close-up of a very inquisitive red fox squirrel. I halted the process of opening my eye, long enough to gather both a bit of collected composure; that most certainly *IS*, a bit of an unnerving greet!, after all; and to allow the squirrel time to realized there was no danger coming. I don’t think it mattered. All the while, in the distance, the pileated woodpecker, began his cycle again: “Thrud-d-d-d-d-d-d-d Thrud-d-d-d-d-d-d-d Thrud-d-d-d-d-d-d-d.” Then it stopped for a bit, only to resume, in the same cyclical order as before. Meanwhile, Mr. Fox Squirrel was checking me out. I felt comfortable that I could waylay any attempt -by this little fuzzy-tailed rat- to pick my eyeball out for lunch; should such a notion strike. I had my bow cradled in a stand in front of me, on my lap I held two broad head arrows attached to aluminum shafts. I was quite confident I could dispatch any attempt in stealing my eye ball! So I just watched and observed. The stare-down wandered off into the deep universe that is the blackness found in the pupils- of all living creatures; for what seemed an eternity, but was more like 3-4 minutes. It’s an unnerving thing to have such an intimate non-verbal communication with an alien being. It’s also quite enjoyable. Once you get past the notion of it wanting your eye for ocular sushi. We were headed, no doubt, into another eternal four minutes, when suddenly there was a rustle of feathers just above my head. I heard it. Felt it. But did not lose eye contact with Mr. Red Fox Squirrel. Nor he with me. Yet, I could see that he did ‘look up’. I didn’t see his eyes move so much as his ‘attention’. It was uncanny. Sort of like ‘he’ was really some little entity, wandering about in the recesses of his head, in a ‘control room’ of sorts. And his ‘attention’ had just been drawn to the ‘upper monitors’. “Incoming. Identify: Friend or Foe. Fight or flight. Assess! !” All that in a split second. Then the …“Thrud-d-d-d-d-d-d-d, Thrud-d-d-d-d-d-d-d, Thrud-d-d-d-d-d-d-d, Thrud-d-d-d-d-d-d-d!” Took off just a couple of feet above my head! Chips were flying all over the place and the noise was deafening!! But me and Mr. Squirrel? We keep right on staring it down. Well, at least I did. He, on-the-other-hand, appeared to still be adjusting the monitors up in the control room. Well … that is a good question. I am sitting on a limb stand, just 14’ off the ground and there is a large off-shoot limb right out in front of me. I didn’t cut it out because it offered good ‘diffusion cover’ and did not present any problem with gaining a full draw, smoothly and quickly in any of a 190 degree radius. Mr. Squirrel was on that limb, clinging with his hind legs, hanging DOWN, and into my face. If he let go, he would drop right into my face. “Thrud-d-d-d-d-d-d-d, Thrud-d-d-d-d-d-d-d, Thrud-d-d-d-d-d-d-d, Thrud-d-d-d-d-d-d-d!” , started the second cycle of pileated pounding for bug-breakfast. It stopped and Mr. Squirrel and I were settling in for another ‘eye-down’, when the real fun began. Unbeknownst to any of us: Mr. Red Fox Squirrel, Pileated Pounder Pete and me, the Snoozy Deer Hunter, there was a fourth partner in this autumnal woodland party mix. For almost as soon as PPP began his third series of, “Thrud-d-d-d-d-d-d-d, Thrud-d-d-d-d-d-d-d”, …. Mr. Great Horned Owl leaped from his branch, tucked his wings into a hell dive and ‘booked-it’ for Mr. Red Fox Squirrel. This one motion – put into action a most unsettling – and chaotic chain of events. I could not see any of this, only hear it. Mr. RF Squirrel could. But he never ‘seemed’ to take his eyes off of me. Yet, in an instant he was springing for the top of my head while I, was still locked on the inner universe of his eyes..! So my reaction was totally … dead-pan. I just sat there. Probably a good thing considering the breaking action that was just about to take place. Three feet into the dive, Mr. Hootie Owl zipped by the head of PPP scaring him near dead-on-sight, sending, now addled PPP, into a rapid exist of rustling, big, black wings and much “Wuk-Wuk-Wuk-ke-ke-ke-ke” screaming. This, broke my concentration, and it sent Mr. RF Squirrel spinning on the top of my head like a whirling dervish. I was not yet in full ‘abandon ship mode’… yet. But the thought was beginning to take shape as the little feet of Mr. RF Squirrel beat stomping ruts into the top of my hat. Just as Mr. RF Squirrel was getting set to lauch, Mr. Hootie Owl, hit him like ton of bricks. That’s what it felt like on my head! OUCH!! The last thing I remember seeing – before waking up in a bit of a suspended position, at the end of my far too loose ‘life line’, was Mr. RF Squirrels bushy tail flailing limp in the breeze as his whole body, tightly in the huge grappling talons of Mr. Hootie Owl, undulating with the big guys wing beats. A few minutes later I came to: upside down; my head pounding; and the world spinning in a most disorienting inverted format. I distinctly remember thinking, “Well, Mr. Owlie! This is a fine mess you’ve gotten me in.” Then I passed out again. I awoke a bit later and with a bit more realization that I was in a predicament. I began to assess the damage and devise a plan of extraction. Nothing broken: amazing. No cuts: no blood flowing or clotting. There would undoubtedly be bruises. Now the next thing: “How the devil was I going to get down from this?” Fortunately, I was in my mid 30’s, in excellent physical condition and had actually practiced just this sort of ‘unexpected situation’. After a bit of contortionist moves, I was able to grab hold of the strap, pull myself back up to my stand; about 4 feet; just about at my feet level. And scramble back onto the blind platform. After I got myself settled. Calmed a bit. Cleared my head and my vision. I looked around. He was standing there. Just looking. No. More like staring at me. How long he had been there, I have no idea. Both times I ‘woke-up’, I was not really with it. And the second time, the only thing on my mind was finding a way out of the mess I was in. I’ll say this: If he was watching the whole time, I’m sure, that if deer have post-season conversation about their most interesting experiences, he was going to take the trophy cup home; hooves down! Especially if he got to witness the whole enchilada. I just looked back at him and said, “Well, Mr. White-tailed Deer, I will have to take a rain-check on today’s events. Something else has come up and I need to attend to it.” And on that note, I puked my breakfast up – in fine projectile-fashion – out and – fortunately – just shy of my bow. The deer, just stared. He did not know what to think. No doubt! After a moment he snorted, stomped his front feet a couple of times, then just trotted away a few feet, to resume walking until he was out of sight. And… Lord’s Eye True!! I could swear I heard him laughing!! I know .. once I gained my composure, I was: Laughing!! It was nervous, Adrenalin laughter, but it was laughter! I was very glad to be alive and live to tell the story. Every time, I hear a woodpecker drumming-drill, I immediately experience myself UPSIDE down and wondering, ‘How am I going to get out of this!? !’ I feel most fortunate, to still be around to enjoy the smile that creeps across my face, when this happens. From that point forward… I make sure to use a very short-secure strap; full upper-body harness; secured well to the trunk-of-the-tree; when hunting from a tree platform. Because… Man, O’ Man! You just never know when a Pileated Woodpecker will signal you that a wild ride is coming. Best thing: Be Prepared. PERIOD!! Pileated Woodpecker (Dryocopus pileatus) the crow sized bird, who is a living jackhammer of the deciduous forest. A striking cousin to the now believed extinct – giant – Ivory Bill woodpecker (Campephilus principals). The pileated woodpecker is very similar in appearance, but is a good 4” shorter in height and a few decibels below the Ivory Bill; in it’s call and its resonate drilling-drum for insects in the forest trees. This image was inspired by a photograph taken by my Facebook Friend, Kurt Rhymestine, of Herkimer, NY. Kurt’s photographs are amazing. Be sure to give them a close look, on his Facebook Page – https://www.facebook.com/kurt.rhymestine . Thanks Kurt for the infusion of inspiration to illustrate this ‘wild moment in life’ story. Best! !